Make My Flooring America your first stop in your remodeling journey. We are your source for luxury vinyl planks in Webster, TX. When you visit our full-service flooring showroom, you will gain the materials, resources, and support you need to complete your project. Thanks to our versatile selection, helpful staff, and professional installation services, we make changing your interior design a simple and rewarding experience. Investing in new flooring is your chance to steer your interior design in new and exciting directions. With a luxury vinyl plank floor, you will elevate the appeal, and reinforce the strength, of our property. Our showroom has teamed up with the well-known brands to offer a wealth of flooring options. On top of that, we can facilitate luxury vinyl plank floor installation. Thanks to our professional installers, you can enjoy your selections as quickly as possible. Ease of Maintenance: Luxury vinyl planks have a resilient, non-porous surface that repels liquids, water, and dirt. As such, stains have a hard time settling into this material. Cleanup is simple--use a mild detergent and cloth to keep your flooring as good as new. Life-Ready Construction: This flooring type is comprised of composite materials, which means it’s built for your busy and active lifestyle. Luxury vinyl flooring has a pleasant underfoot feeling, yet remains tough against scuffs, scrapes, scratches, and impacts. 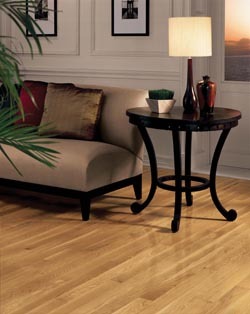 Hardwood Appearance: LVP floor is as close to Nature as you can get--all without the maintenance commitments. Vinyl plank flooring successfully imitates the appearance and texture of solid hardwood. Now, you can enjoy the appeal of pine, oak, and mahogany without worrying about sanding or refinishing. Simply wipe messes away and get moving! With its ease of maintenance, versatile design options, and even soundproofing and insulating properties, luxury vinyl planks are a great addition to any room. Whether you are re-flooring the kitchen, bathroom, or your entire property, luxury vinyl remains a sensible investment. Our wide-ranging catalog of LVP floor is ready for you to explore. Speak with our showroom staff to discuss your project ideas, and we’ll make recommendations that will meet your project goals. When you’re ready to order, be sure to ask about our professional installation services. Get the right flooring, when you need it. Our professional installers have the training and experience to ensure your new flooring looks great and lasts long. It all begins in our showroom. Visit us today and turn your interior design dreams into a reality. Contact us to learn more about our selection of luxury vinyl planks. We proudly serve property owners throughout Webster, TX, including Clear Lake, Houston, Nassau Bay, Sea Brook, and the surrounding area.